Going Green? Though its big time trendy now, years back green brides were coming through my door on a regular basis. Where did they all come from? Awesome green Northern California. The bride in the tea-dyed hemp and silk gauze dress above wanted to know every material that went into the making of her dress. This is becoming more rule than exception. Since more brides are going custom or buying wedding wear in green-alternative boutiques, there's not only a need to know what materials go into the making of a dress but also who is making the piece and where. As one bride put it, "I couldn't stand up and make such an important commitment, knowing in my heart any part of what I had on my body might have been put together by prison labor or in a sweat mill. It just goes against everything I believe in. "Going Green can mean wearing a dress in natural fibers: organic cotton, wool, linen, silk, and of course, hemp. It helps to have a knowledge of the natural dying process and thinking through what impact toxic dyes might have on the environment. Here are some questions to ask: Is that silk I love really its natural color? If it is tinted, was it done with non-toxic dye? Is that snow white silk taffeta chlorined? And was that cotton grown free of pesticides? If you find answers to these questions through the help of a green-savvy designer or seamstress, you could make this a real project planet-style endeavor.Going Green can also mean saving resources by wearing a previously owned gown. So where do you find one? Here are some options. If you’re price conscious this is the place to shop. Gowns that retailed last season for $3000-4000 are typically half off but sometimes can go for as little as $500-600. More good news. You’re going to get very personalized assistance—the same as in a full service bridal salon. Though there will be re-altering involved, you won’t have to wait 4-6 months for your gown. Bear in mind once-worn gowns have already been pre-fit and altered to someone else’s body. Just make sure they’re once-worn; an over altered dress that’s been on more than one body could lose its original shape after a while. Ask how many and what kind of alterations the gown you want has had. Typically, if it’s gone through more than two brides, forget it. In addition to alterations your shop may offer customizing services (for a fee). Shops realize with previously-worn gowns, there’s a kind of possessive energy the new purchaser wants to create to make the gown her own. Therefore some shops focus on customizing. FYI: Naturally bridal consignment shops don’t stock set sizes like salons do. Small and larger brides might have to work closely with staff and keep a lookout locating a gown in their size. Most Vintage clothing stores stock actual gowns from by-gone eras as well as ‘retro-inspired’ selections.that are brand new. The bride in love with a particular era of clothing usually checks vintage clothing stores first. 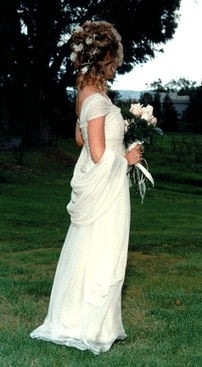 Not all brides opt for an actual gown that survived her favorite era though. Some choose a newer style reflecting the period in natural fibers. Why? Because that authentic 1925 chemise may be so delicate, without proper restoration it could literally fall apart. Think of gowns belonging to the ages like you would certain antiques: some so precious to be considered museum quality. Depending on restoration, the rule of thumb is, the older the gown the less they should be worn. If you are set on wearing that 1910 dress find a specialist in restoration who can advise. Here’s where you’ll find some darling little ladies working for a good cause. And they can be charming and helpful, especially if you’re a bride. Chances are if you're environmentally conscious you’ve gone this route to unearth real finds before so you already know your way around. I have to give you some kudos here. Rummaging through flea markets and thrift stores takes a certain kind of bride—the kind who believes in recycling even on her wedding day; the kind that doesn't give a damn whether she’s wearing hand-me-downs. If this is you, you’re a rarity. And yes, you’re likely to spend hours and days sorting through racks of Four Weddings and A Funeral cast-offs before you uncover that 1963 Priscilla of Boston original in silk taffeta. Thrift shops and flea markets are also the place you'll find recycled fabrics and linens. You've seen those cuts of dimity and silk someone had in their attic. How about curtains, table or bed linens? Some have such beautiful embroidery that are screaming to be made into a dress. Maybe not mom or grand mom's dress; especially if mom was a Dianaesque bride. Suppose your sister or best friend's gown is awesome? Did you know Jean Kennedy wore her sister Pat's Hattie Carnagie sheath for her 1956 wedding? With a little customizing (sash, shrug, a few florals added) you've got a whole new gown. Here's another Did you know? tidbit. In the 1940s weddings were rush events with so many men shipped off to war. Time was scarce and fabric rationed. Ordinarily a war bride wore her best dress which many times was a suit. There's one story about a to-the-floor-formal A-line complete with chapel train in white silk satin, passed on from one bride to the next so many times it was eventually lost . . . I always thought this would make a great premise for a string of short stories by Anne Beatty . . .